Every girl loves to get pampered and probably one of the most exciting things about being a beauty blogger is I get to try out new services or treatments on a regular basis. 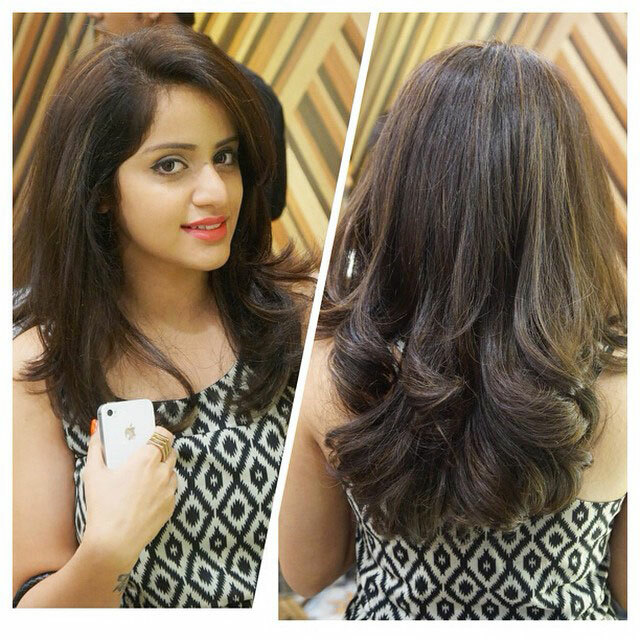 This time Geetanjali Salon invited me over for the opening of their Hair Studio at Select City Walk. I had earlier tried out Kerastase Hair Ritual & Gel Nail Extensions at their property in Green Park (you can check that post here) and was extremely pleased with the services hence I had high expectations this time around as well. 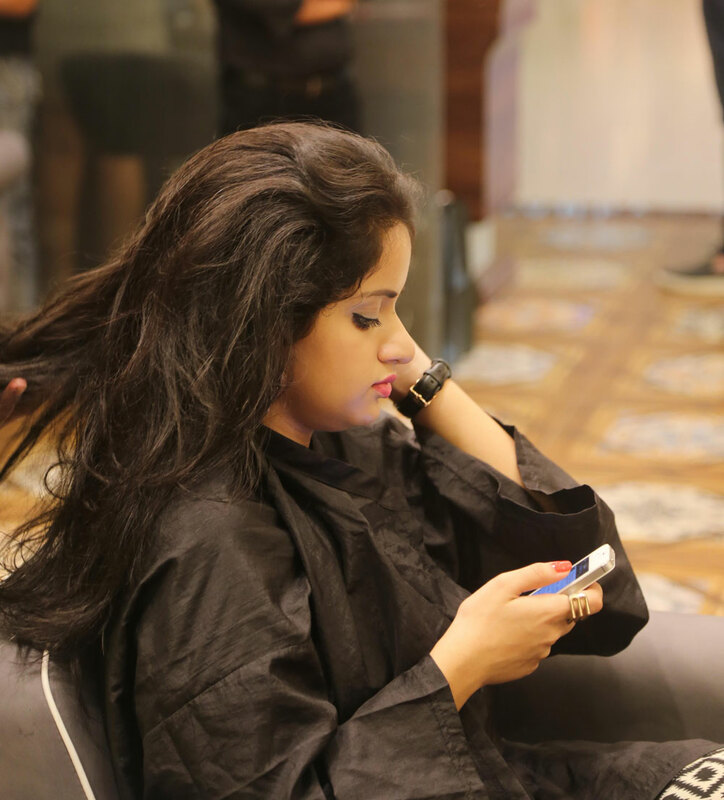 Geetanjali Salons are extremely popular in Delhi for not only their professional and expert services but also for providing the best hair cuts in Delhi. After I wrote about my experiential, many of my friends went to get their hair done at the salon and were very satisfied with the results. I had been meaning to do something drastic with my hair and had been wanting to get highlights done for a long time. Having seen many bad highlighting jobs on Google there was no other salon barring Geetanjali I could trust my hair with. Busy Instagramming at Geetanjali Salon! My hairstylist & I decided that its best if I get global hair color first to lighten my jet black hair so that that highlights compliment it and not look stark. I was adamant on not getting blonde highlights and the color suggested to me, which was Honey Blonde looked quite natural and was a great transformation. I also wanted to get a some blue-green ombre streaks but the hair stylist suggested against it unless its red and since red has been done to death with I skipped it altogether. I posted my new look on IG and till date it has the most number of likes 😀 They colored my hair using Majirel, a salon exclusive hair color by L’Oreal which Shweta told me is the best permanent hair color in the industry and causes the least damage. 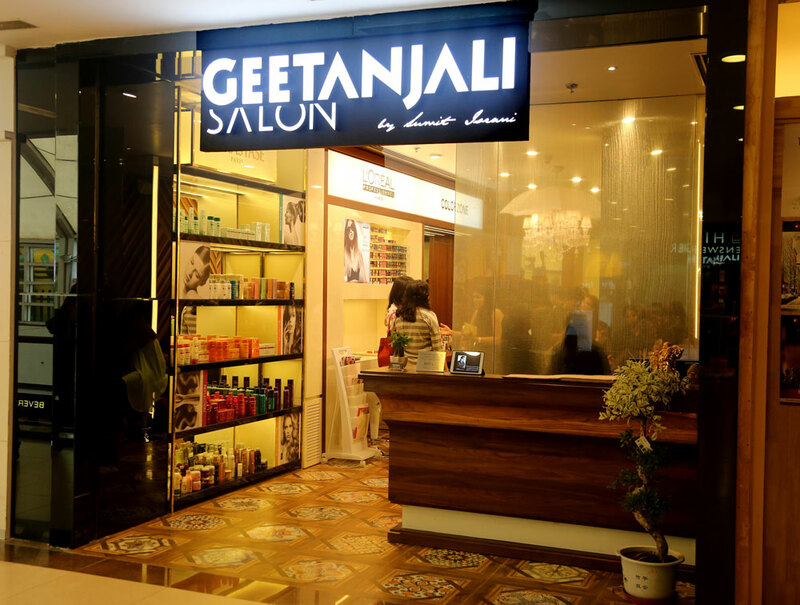 Geetanjali Salon by Sumit Israni is a concept hair studio by famed hair expert and celebrity hair stylist, Sumit Israni. Its an urban tranquil environment where customers can choose from an array of creative haircuts, hairstyles , color and texturing services, luxury hair rituals, Keratin treatments and much more! At this specialty hair studio, your crown of glory is in good hands!!! It is a beautiful salon with wooden interiors and a pleasing staff. They have separate sections for hair spa, wash and routine services. Since I spent quite a bit of time getting the color washed of from my hair I was thankful for the high tech massage chairs. I don’t think I’ve been to a salon which has reclining massage chairs for hair wash! You must pay the salon a visit be it for rectifying a bad hair cut, pampering your hair with a hair spa or for transforming it with the latest hair coloring trends. Geetanjali has always focused on customer satisfaction and they surely deliver!